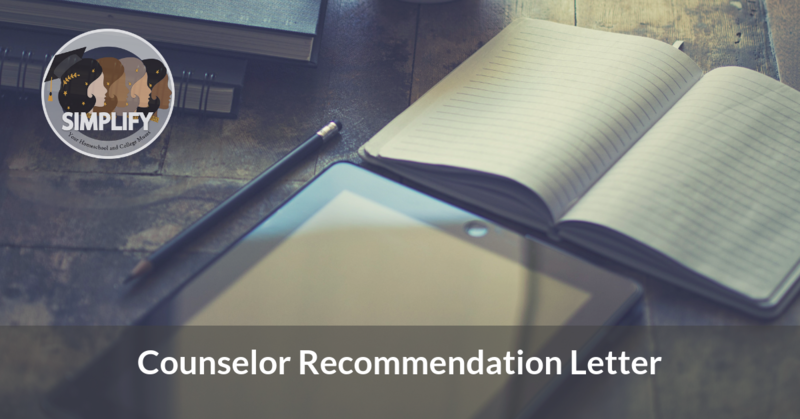 One of the hardest aspects of the application process for a homeschool parent is the counselor recommendation letter. This letter is part of the application on the Common Application and may also be required for other applications. The counselor letter is not part of a student’s application, instead it is the parent’s responsibility as the counselor of the homeschool and will be submitted by you. There is a lot of angst surrounding this letter for many homeschool parents. We tend to put pressure on ourselves and lament the writing of this letter. I believe part of the reason for this is the fact that as homeschool parents we are both the parent and counselor. We want to be objective but have a hard time doing that because we know the student so well. Don’t let this stop you! It is a positive thing that we can talk about our student on such a personal level so use this to your advantage. When approaching your letter you need to think about the function of this recommendation. It is imperative that you see it as another piece of the puzzle. What has been covered already in your child’s application? What is missing that you feel is important? Think about this before starting. Review the application and decide what needs to be added to create a complete picture of your student for the admission officers. At the same time keep in mind that no one has the time to read pages and pages of a recommendation. I advise clients to keep their letter at 1 to 2 pages. I myself wrote only a one-page recommendation. Others I know use more than that, but you should try not to go on for too long. Also remember to put in concrete examples in the letter that demonstrates what you are saying about your student. If you are still feeling a little nervous about writing this letter remember this is only one small part of your student’s application. Also it is helpful to remember that in a public school setting a guidance counselor who may or may not know the student is writing this letter. This recommendation isn’t going to make or break your student’s application but it can and should give the admission officer one more positive glimpse of your student. To help you get started with your letter, we have an outline to view and a sample letter. This is just a starting point for you and your letter. Personalize yours, change the format, do what works for you. Good luck!